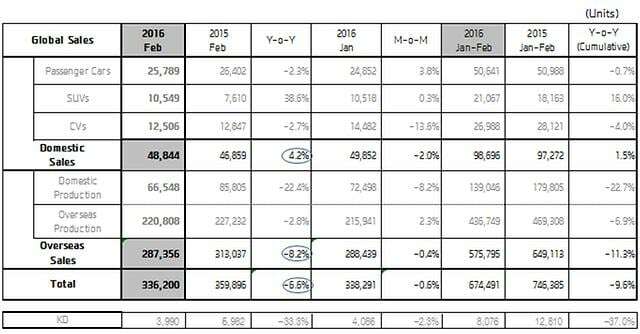 March 4, 2016 – Hyundai Motor, South Korea's largest automaker, reports its domestic and overseas sales results for February 2016. 1. Commercial Vehicles (CV) include LCV, buses and trucks. 3. Domestic Production relate to the vehicles produced in Korea for the overseas markets. - Global sales in February 2016 totals 336,200 units – a decrease of 6.6% YoY. - Global sales declines due to gloomy economic situations in emerging markets. - Surging sales of Genesis G90 reaches a total of 2,476 units in Korea this month. - Elantra perseveres sales increase in the U.S. in line with economic recovery. - Sales figures reveal a solid performance in India as Grand i10 vanguards a strong growth. - Brazil and Russia plants post monthly recovering figures due to strengthened sales promotions despite unfavourable market situations.